Неоконченное Дело (The Unfinished Case) is a Soviet play, written by Yakov Borisov  and directed by M. Malinin, performed at the Vologda Regional Theatre from 27 december 1963 to june 1964 , starring Pavel Budyak as Sherlock Holmes. According to the characters the play is probably adapted from Arthur Conan Doyle's stories The Adventure of the Yellow Face (Monroe & Effie), The Sign of Four or The Red-Headed League (as Jones may refer to Athelney Jones or Peter Jones) and maybe others because of Professor Moriarty. 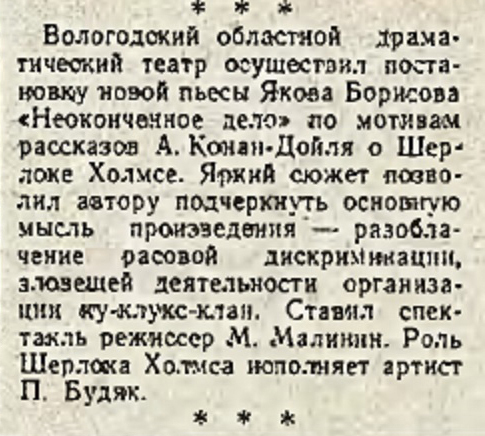 ↑ Collective nickname of authors Yakov Dymskoy (Яков Дымской) and Boris Privalov (Борис Привалов). ↑ 148 performances in 5 theatres between january-june 1964, and 211 performances in 7 theatres over the entire year 1964. This page was last edited on 11 July 2018, at 22:57.